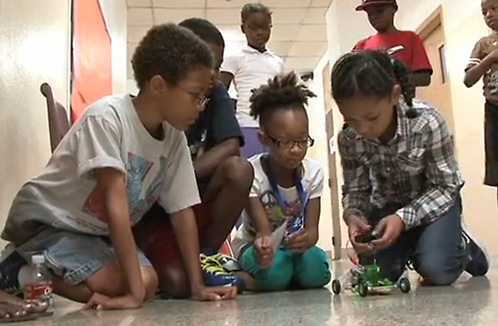 About 300 elementary students from across the Houston area spent the last few weeks learning how to build renewable energy-based vehicles as part of a concerted effort to increase the number of minority engineers in the future. The students were part of the Summer Engineering Experience for Kids (SEEK) camp at the Young Women’s College Preparatory Academy, which was organized by the National Society of Black Engineers, with support from Shell and the University of Houston. This entry was posted in Uncategorized and tagged National Society of Black Engineers, SEEK, young women's college prep academy on July 16, 2013 by HISD Communications.